BEACON FALLS — On her fifth birthday, Michele LoRusso’s kindergarten teacher at Gilmartin Elementary School in Waterbury gave her a copy of “Holly Hobbie’s Answer Book.” Thirty-five years later, she still has the book. LoRusso is doing her part to spread a love of reading as a reading specialist at Laurel Ledge Elementary School, and her efforts haven’t gone unnoticed. She was named the 2019 Teacher of the Year in Region 16, which is comprised of Beacon Falls and Prospect. With a love of reading and a thirst to learn, it’s not surprising that LoRusso chose a career in education, even though she is the first person in her family to become a teacher. LoRusso started her career as a student teacher at the former Community School in Prospect, and she has worked in the district since. Over the years, her role in the region has evolved. In the 2000-01 school year, she was hired as a fourth-grade teacher at Community School. LoRusso taught fourth grade for nine years, during which she earned a master’s degree in reading with a certification in remedial reading from the University of Bridgeport. She spent two years facilitating the district’s transition to the scientific research based intervention model for learning, and a year as a math interventionist at the former Algonquin School. LoRusso, who coached the Woodland Regional High School dance team from 2007 to 2012, has been a reading specialist at Laurel Ledge for the last six years. LoRusso’s duties as a reading specialist are wide-ranging and include analyzing data to develop lesson plans, screening students to identify those in need of intervention, working one on one with students that struggle with reading, teaching classroom teachers on the best and latest practices, teaching model lessons in classrooms, and teaching phonics to kindergarten students. Each day is something different. “Google calendar is my lifesaver,” LoRusso joked. However, it all comes back to fostering a love of reading in the students. This past school year, LoRusso used an innovative grant from the region to buy multiple copies of books for teachers to start book groups and book talks. For National Book Week this year, she made a video with staff members talking about their favorite books when they were children to show to students. “I loved going into rooms seeing kids reading the books that their teachers were talking about (in the video) because then you know they were connecting,” she said. Larne Ledge Principal Regina Murzak said LoRusso is a huge asset to the school and the region, and her being named teacher of the year is a well-deserved honor. “She has so many skills, but I would say her strongest skill is she has the unique ability to be able to adapt and plan for the needs of both adult learners and student learners,” Murzak said. In the future, LoRusso may continue her own learning by going back to school to get a library media specialist degree to go along with her bachelor’s degrees in anthropology and elementary education from Western Connecticut State University, her master’s, and her administration certification from Sacred Heart University. She would also like to be an administrator someday, maybe a principal or a curriculum director. 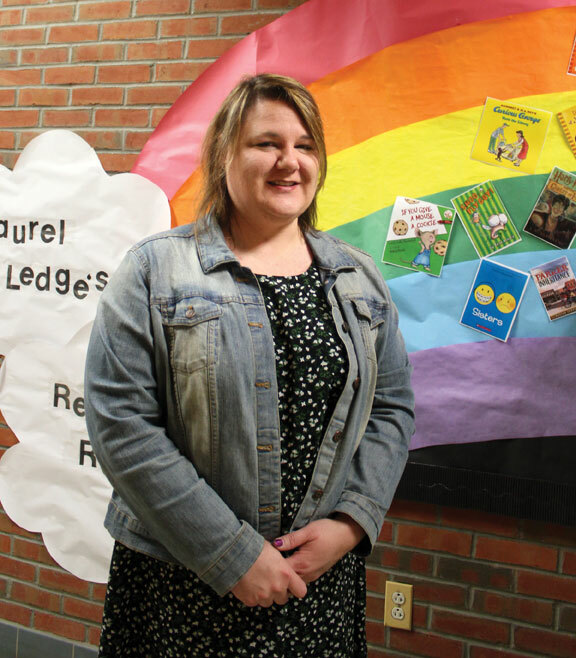 But, for now, she’s more than happy to continue to spread her love of reading at Laurel Ledge and represent elementary school teachers — who she feels are among the hardest working people — as Region 16’s 2019 Teacher of the Year. “I feel like it’s an honor to represent the elementary teachers because I’ve spent my career in elementary education, so I know what it means to work in an elementary school,” she said.